CO2 Distillate by Secret Garden Extracts (1ML syringe, just over one gram in weight) is the newest and most pure concentrate product available. The producers of this high-quality product employ superior extraction methods, which yield potent and pure THC products. 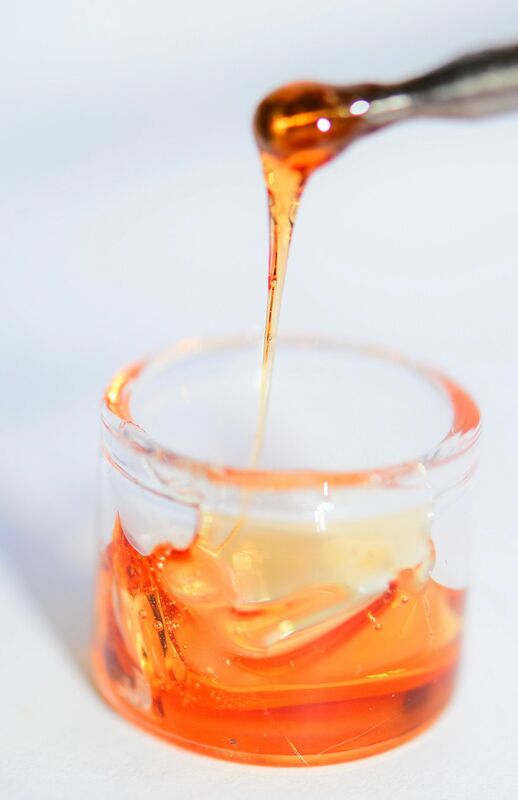 This distillate is purer than others because it extracts plant matter, chlorophyll and all other solvents. After vaporizing the THC and CBD, that vapour is collected and condensed back into oil. This end product produces no smell or flavour when vaporized, making it the purest of its kind out there. CO2 Distillate is made using supercritical Co2, and then distilled, so there was never any solvent introduced to the process. The flavours added are from 100% cannabis derived terpenes so you know that the flavour is as authentic as you can get. Available for purchase in 1ML oral syringe for easy use and storage. Amazing stuff. Provides that extra kick to a terp flavour, would recommend using small amount to top off a more varied profile dab or bowl because of high pure THC content! Extremely thick, and very clear. AWESOME! Very please with this product! It is also fully activated, and can be eaten or topically applied. Can we use it to fill a recharge 1g of secret garden ??? Yesterday I took a micro drop on my herbal vaporizer, Snoop Dogg model. BANG! I was sitting in my living room and lucky because it got me inside like a truck. I will have to find the right quantity everything. some recipes for mixing in a regular vaporizer? Each vape is different, I’m not sure what you mean by recipe. It is pure THC distillate. Some vapes can handle the viscosity, some are designed for thinner oils. I like to vape it straight, using a small drop on the end of a dabber. What vaporizer are you wanting to use this with? Great service, order arrived with in 3 days . Great product for the price. Just wondering if I can put it in my vape pen . Very thick . I can barely squeeze it out of the syringe. Am I Doing something wrong ? Excellent quality, burns super clean. or use a shot glass and a syringe and do the same thing you would do for some shatter wax.